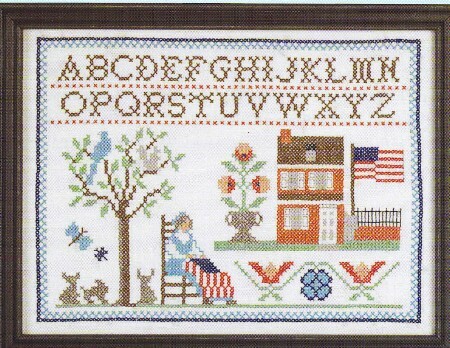 This stamped cross stitch sampler craft kit pays tribute to the most Patriotic seamstress in America, Betsy Ross.She is pictured outside of her famous Philadelphia Home sewing the American flag.This cross stitch printed craft kit takes delight in showing Betsy happy,sitting under a cool tree along with her cats and dog. Very nice quality! Easy for my daughter to do and will be beautiful when it is finished. I like this very much a lovely reminder of great holidays spent in the USA. I am so happy with my purchase! It's going to be beautiful when it's finished! The quality is excellent and the transaction was a breeze! I'll definitely order again as she has many selections to choose from!